Candace – LO listing coming up…more details to come. Bill – Colonial Heights home, refinished floors, English Tudor, $520,000 – Going on market Monday. Sue – Buyers looking for small in-town Farm, 3BD/2BA on acreage. Kathryn – Looking in Alberta or on Hawthorne, $350-400,000, 2BD/1.5BA, Cash buyers, ready to buy! 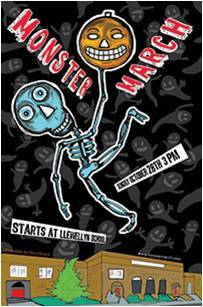 October 28th – Monster March – Join the fun, starts at 3pm! December 1st – Claus and Paws. It’s coming up! Never attempt to solve a conflict under high emotional stress. You can choose the amount – weeks? months? Defaults to one week – show the trends for a longer period of time. Sellers always want to know what you are doing to sell their home. Be proactive and supply them stats before they ask. We will have a workshop with John Anunsen if you’d like to set any of these up – or learn how best present yourself/stats.